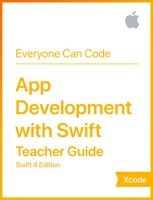 This Teacher Guide, a companion to the two-semester long App Development with Swift course, is designed for you to use with high school and college students. It includes tips for extending or adapting lessons, increasing collaboration, and assisting students who need extra support. It also includes downloadable Keynote presentations for each lesson, solution code for the labs presented in the student guide, and a rubric for evaluating student work.